These end tables have well served members of the family for over 40 years and are in good shape other than the condition of the top surfaces. I thought I'd try a little chalkboard paint after some sanding and it worked great! Perhaps we'll find a new home for these end tables yet! That is so cool!!! I wish I was skilled in this sort of thing. Oh what a great way to repurpose something that's been in your family for all those years! They turned out great! Cant't go wrong with chalkboard paint! Love the top! I'm hosting a linky party "One Creative Weekend" at OneCreativeMommy.com. I'd love for you to visit and link up this idea and/or anything else you'd like to share. They look great! I do love chalkboard paint projects! What an incredible idea! I love the way they turned out. I haven't ever used Chalkboard Paint, but it's on my radar now! 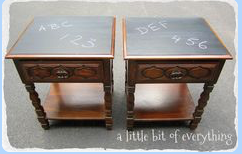 I love chalk boards on furniture. Great job. Thanks for sharing at the All Star Block Party. Such a fun idea. Love it. Thanks for joining TTT. How fun! I love chalkboard paint and have project that I need to work on using it but just can't find the time! LOVE LOVE LOVE this!!!! I'm delighted that I found your amazing blog on the Thursday Blog Hop and can't wait to read more of your DIY amazingness!! I’m so glad you linked this up at One Creative Weekend! I love it! I hope you'll come back tomorrow. It's great when a piece of furniture gets a brand new lease of life. Another 40 years! Really cute. I think they would be so fun in a childs room or an office. Thanks for sharing with Share Your Cup. What a fun idea! This would be especially good with little kids in the house--they could have fun and not worry about the precious furniture! Super cute! I never would have thought of that. Following you from the Friday Blog Hop and would love a GFC follow back as well as for you to join in the Weekend Blog Walk blog hop at http://www.athometake2.com. We've got a great group of bloggers linking up every weekend.